1. Length – to keep the exposé brief – one or two paragraphs (if possible – there’ll likely be exceptions). 2. Easy to Share – To make them easy to share (like a meme), I will present a link (just below the title) that you can copy which will allow you to send links to that specific meme and meme-busting explanation beneath it. 3. Easy to find -since this is a series, the list of unmasked memes will grow. To make them easy find, I will keep a running list of them here. Bookmark the site for easy reference to them. 4. Documentation – Unlike memes, these explanations will provide you with links and references to where the claims in the debunking exposé come from so you don’t have to take my word for it. You can look it up yourself. So without further ado, here – in no particular order are the first five memes, and why they are wrong. 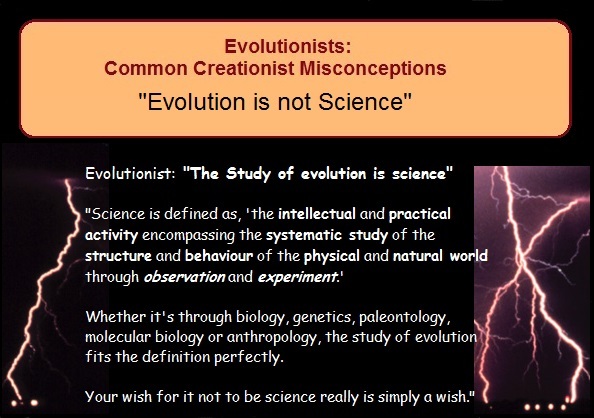 These memes carry the theme of “common creationist misconceptions” – trying to show why the given statement is incorrect. The statements are correct, and the exposé explains why. When dealing with evolutionists you’ll find a lot of their arguments are made on the basis of the fallacy of equivocation – the illegitimate switching of a term or terms in the middle of an argument. (I detail this tactic in Games Evolutionists Play: The Name Game) Therefore you must be precise in your definitions. When creationists say “evolution has never been observed” we are referring to molecules-to-man evolution – or macro evolution. Evolution from basic chemicals in the supposed primeval pond to man (or any other complex creature) – that type of evolution has in fact never been observed. 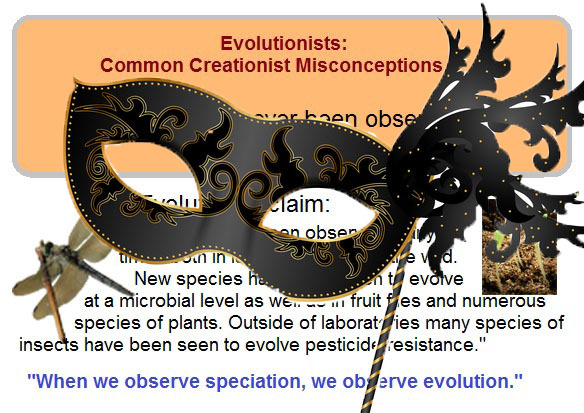 When evolutionists claim “evolution has been observed” they are speaking of variation – or micro evolution – which no one denies. For the difference between Microevolution and Macroevolution see neo-evolutionist Dobzhansky’s realization here. 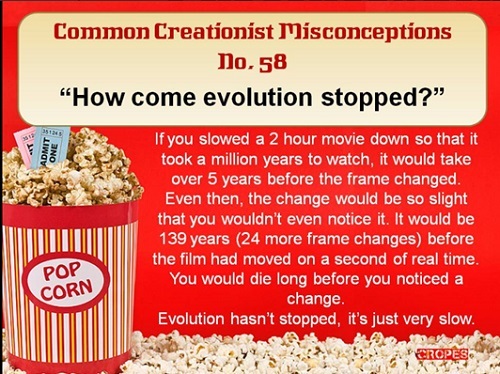 In passing, notice the equivocation on the word “evolution” and beware – it’s a common tactic of evolutionists. On the claim about speciation, see the next meme. Creationists are referring to molecules-to-man-evolution when referring to evolution . 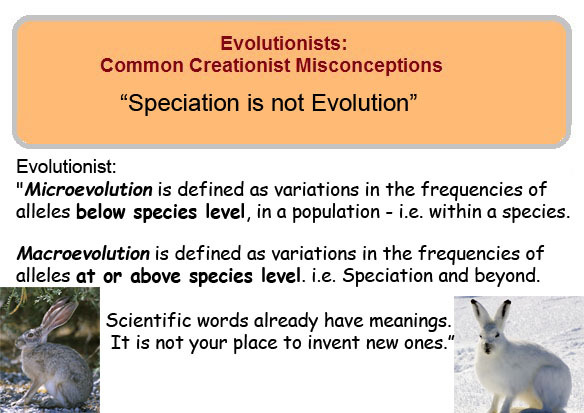 Speciation aka Variation aka Microevolution deals with minor changes within a Biblical kind. Evolution aka Darwinian evolution aka Macroevolution deals with large scale changes from one kind to other kind, such as from bacterium to biologist which has never been observed. Clearly defined, evolution (molecules-to-man) is not merely Variation (or speciation or minor changes within a kind); thus creationists who make that claim are correct – once all terms are defined and understood. 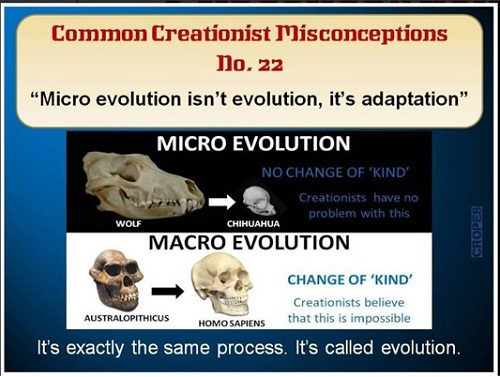 When clarified in this manner it is obvious that microevolution is not macroevolution. Evolution is not science because according to the definition of science used in the meme itself, among other things, science is observable. But evolution is not observable. 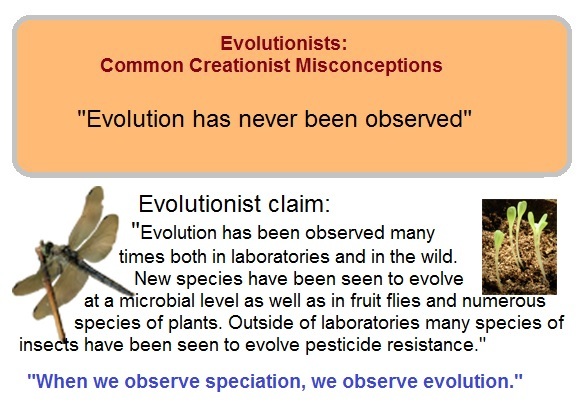 This is acknowledged by the evolutionist making this meme, by claiming in another meme (here) that evolution is too slow to be observed, thus refuting himself his claim that evolution is observable. This is a rather disingenuous response. Once again we see evolutionists trying to hide the failure of evolution to explain the origin of life behind definitions. It is correct that Darwinian evolution necessarily begins with two reproducing members of a species; without which natural selection has nothing to select from. As noted neo-evolutionist Theodosius Dobzhansky put it: “Prebiological natural selection is a contradiction of terms.” Put another way: without pre-existing life, Darwinian evolution is impossible. There are only two options for the origin of life: Either God initiated it or some material process initiated without God’s intervention. The process apart from God – whatever the details may be – is called “evolution.” Aside from these two options, there is no other option for the origin of life. Darwinists don’t believe God initiated all life. 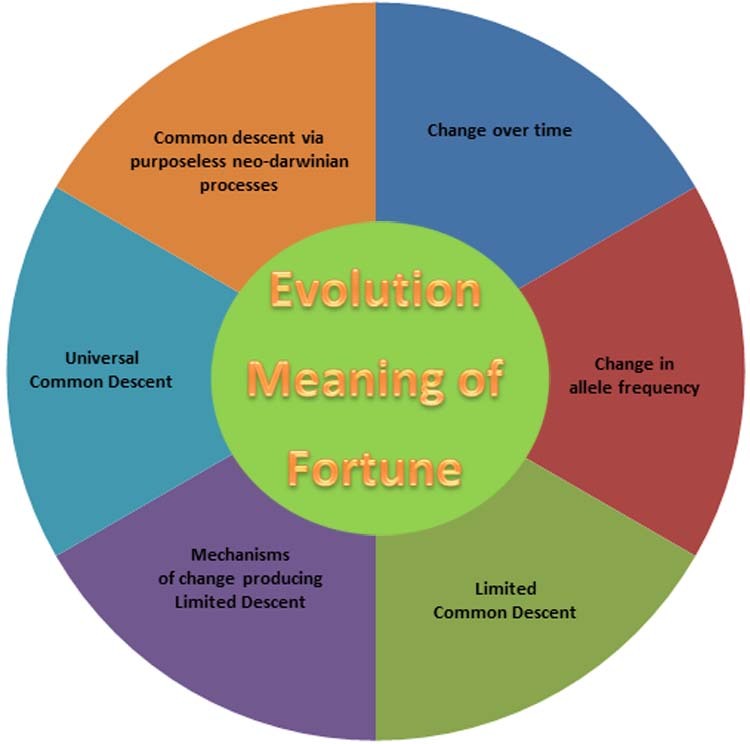 Thus they are left with the only other option – some process – typically called chemical evolution or abiogenesis – as the origin of life; but these terms are included as part of the generic term “evolution”. 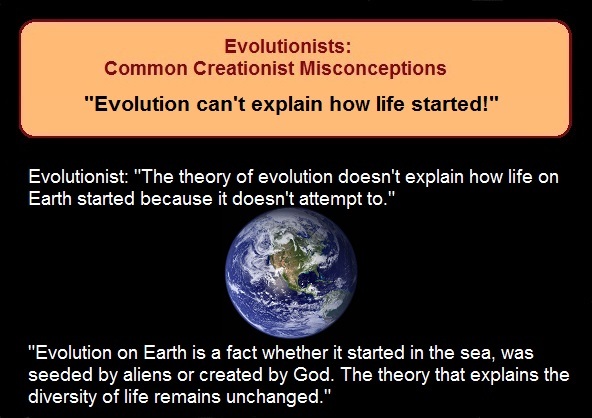 Thus to say “evolution” doesn’t attempt to explain the origin of life is to equivocate on the meaning of the word “evolution”: pointing to Darwinian evolution while denying they believe in Chemical evolution aka abiogenesis – which they must believe in to explain the origin of life since they deny God’s intervention. Note also the propensity to claim evolution as a “fact” – another equivocation on micro vs. macro evolution (see the above meme on that). This is more a concern for Big Bang believers, but since it’s presented with the memes of evolution, and since evolution cannot be true if the Big Bang isn’t true (which it isn’t) I’ll address it. This can be approached from two perspectives: the logical errors, and the physical impossibilities. Next, let’s look at what is known as a category error. The mistake: treating something as if it were nothing. Simply put: something that exists is not the same as something which does not exist. 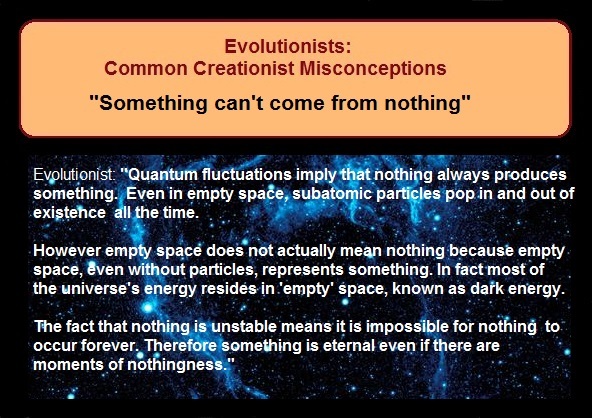 They don’t get to claim “quantum fluctuations” did anything if they are truly “nothing”; meaning – lacking existence. The problem is “quantum fluctuations” are in fact something that exists – which they treat as nothing – and thus the fallacy and the failure of the theory: they don’t really start from nothing. They can’t talk about them popping into and out of existence in space because “space” is not “nothing.” Which brings us to the next category of errors. And so concludes the unmasking of this first group of misleading evolutionary memes. Remember a running list of all these can be found at http://rationalfaith.com/mememistakes/. If there’s an evolutionary meme you’d like to see unmasked in a future article, send me a link to it here. Since I won’t be presenting them in any particular order, to easily find the response to a meme check the list – which will continue to grow as more erroneous memes are addressed. 9. Darwinists who are purists are in view here, not those who are confused and believe in theistic evolution. 13. In the equation E=mc2 , E = energy, m = mass and c=speed of the light (or c= 186,000 miles/sec) you’ll note that c is squared, which gives an extremely large number and so for a little bit of mass a lot of energy is released. This explains the power behind nuclear weapons. This entry was posted in Abiogenesis, Big Bang, Creation, Dark Energy, Evolution, Macroevolution, Meme Mistakes, Microevolution, Pseudoscience and tagged Paul Nelson, Theodosius Dobzhansky by Duane Caldwell. Bookmark the permalink.